Available as low as $1.79 per coin over spot! One of the more beautiful silver coins for sale on the European continent is the Silver Armenian Noah’s Ark coin. Introduced for the Republic of Armenia by Geiger Edelmetalle in 2011, the initial release of the coins included these 1/4 oz coins, 1/2 oz coins, and 1 oz coins. 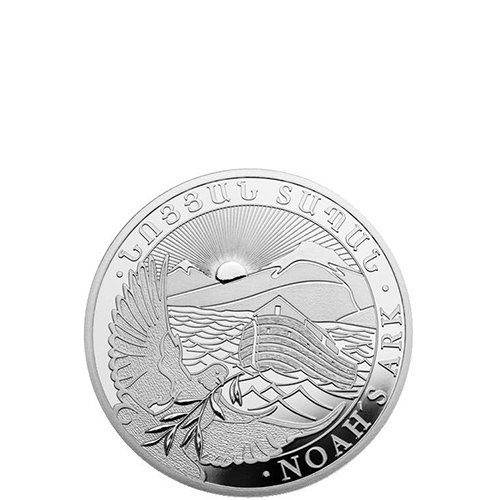 Right now, 2019 1/4 oz Silver Armenian Noah’s Ark Coins are available to purchase online at Silver.com. Ships to you inside of protective individual flip, mint tubes of 20! Ninth available year for the Silver Armenian Noah’s Ark coins! Consists of One-Quarter Troy ounce of .999 fine silver in BU condition. Bears a face value of 100 Dram backed by the government of Armenia. 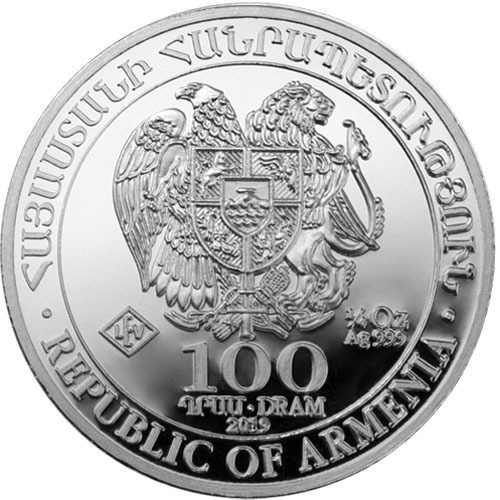 The coat of arms for the Republic of Armenia is on the coin’s obverse. Noah’s ark features with a dove in flight on the coin’s reverse. Each 2019 1/4 oz Silver Armenian Noah’s Ark Coin in this listing is available to you in Brilliant Uncirculated condition. The 1/4 oz coins in the Noah’s Ark Series are housed in individual protective packaging or mint tubes of 20 coins. The design of the Silver Armenian Noah’s ark reverse is a creation of artist Eduard Kurghinyan. The images of Noah’s ark on the coin reflect the nation’s close relationship to the Christian faith. The Apostolic Christian Church was adopted as a state religion in 301 AD and the oldest Christian churches in the nation date back to the 1st century AD. 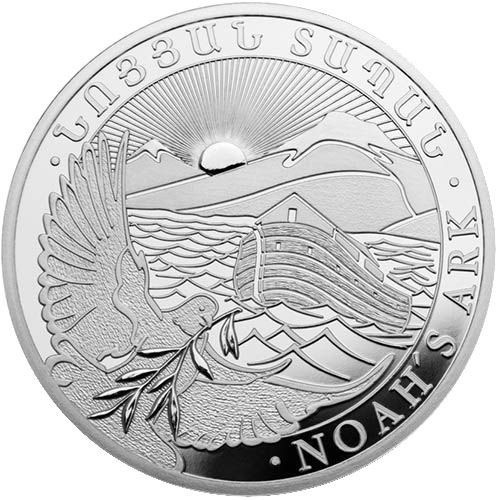 On the reverse of 2019 Silver Armenian Noah’s Ark Coins is the design of Noah’s ark. The massive wooden structure is featured in the center of the design as it floats atop waters that have flooded the world. The sun rises over the peak of Mount Ararat in the background, where the ark would eventually come to rest, while a dove flies into the foreground clutching an olive branch as a symbol that dry land is available to the passengers of the ark. The obverse of 2019 1/4 oz Silver Armenian Noah’s Ark Coins features the coat of arms for the Republic of Armenia. The design of the heraldic shield is quartered with various animals, while the center of the shield features a small depiction of the ark resting on Mount Ararat as flood waters recede below it. The shield is backed by a lion and an eagle. If you have any questions, please feel free to reach out to Silver.com. You can contact us at 888-989-7223, online using our live chat service, and via our email address.